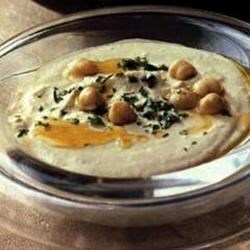 "A straightforward hummus that may be augmented with roasted red peppers or olives. Serve with crackers, flat breads or on a pita with sprouts for a great light lunch." Place garbanzo beans in a food processor and blend into a spreadable paste. Mix in lemon juice, garlic, tahini and crushed red pepper. Blend until smooth, using more lemon juice if consistency is too thick. Yeck- WAY too much garlic. Even the garlic-lovers wouldn't touch it. I just made this and it was very good! For those of you who don't have tahini, I didn't have any so I left that out and it still tastes like hummus to me. Dang good and real easy.